Abington Art Center’s Pavilion was built in 2000 and designed to engage with the natural setting and the Center’s Sculpture Park. During 2016 renovations, the 2500 sq. 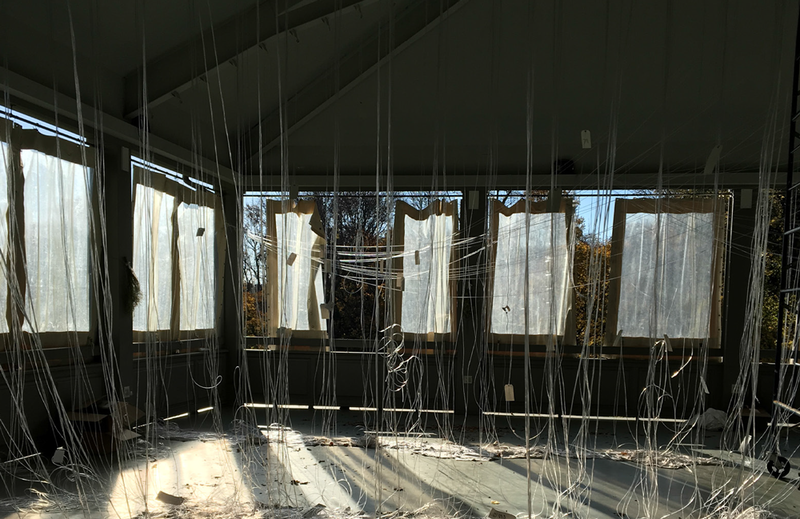 ft. ceiling needed to be replaced and Mily-on was asked to create both an artistic piece and a practical solution for the structure and its use as a space for private and public events. Preliminary Concepts tested a variety of design patterns. 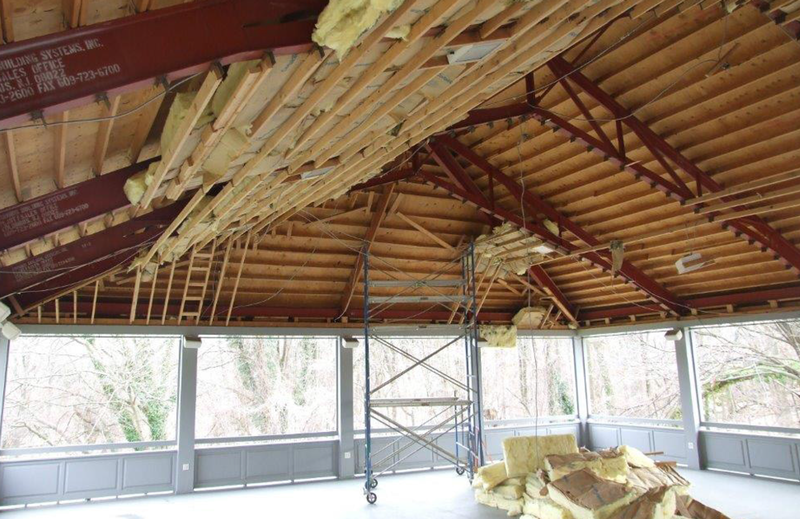 The beaded board ceiling was removed and the steel clips used to hold it to the roof beams inspired their reuse for the fiber optic design. Preparing the materials; Each strand of fiber optic had to be measured and labeled for its location. 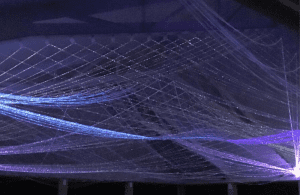 Strands of fiber optic were threaded through the steel beam clips on the ceiling. Once threaded, strands were ready to be woven according to an elaborate pattern. Day and evening views of the completed installation. Mily-on thanks Claire Beevers of Philadelphia University for material research and Calfayan Construction for equipment and labor support. 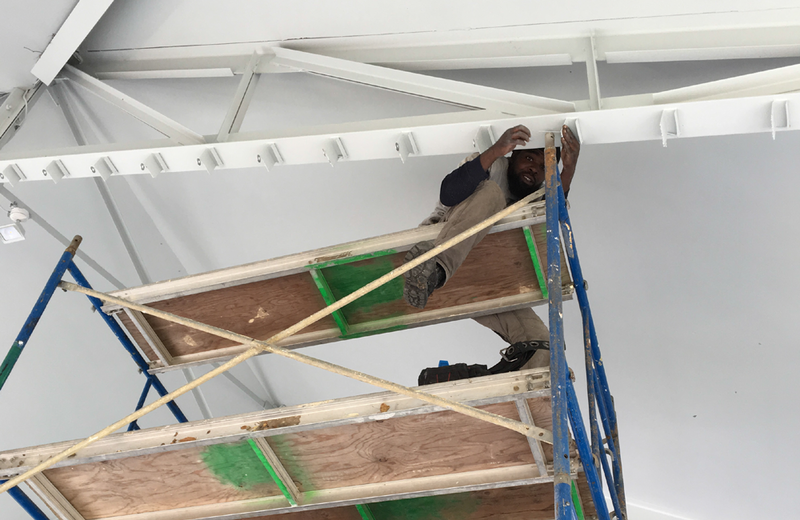 Abington Art Center wishes to thank Bruce Toll and Steve Schwarzman for their support of the Pavilion renovations that included Cosmic Ceiling. Mily-on is a Philadelphia-based design collaborative that incubates, curates and constructs new products and experiences using light as the primary medium. Founded by architect designer Roman Torres and creative entrepreneur Ivy Silver in 2014, Mily-on projects combine elements of play, contemporary design and technology to solve real world problems and artistic applications. Their process is uniquely integrative and iterative–working to bridge the gap between maker, user and product. Mily-on’s debut products currently in development and production include Firefly, Hakari and The Ivy. Each creates a unique lighting experience suitable for limitless applications, evokes magic and pushes the edge in terms of the latest technology and accessibility for consumers.